The Odyssey ScoopCast continues its interview series with one of Adventures in Odyssey‘s best! The Odyssey ScoopCast welcomes Blimey Cow’s Josh Taylor into the ScoopCasters guild as co-host of the show. 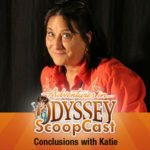 In addition, we continue our interview with Katie Leigh, voice of Connie Kendall on Adventures in Odyssey. Katie discusses her interaction with Jess Harnell, voice of the animated town mailman, Wooton Bassett. Plus, she describes the process of writing her upcoming book.